The comb bookshelf is a product by Jaanus Orgusaar, an Estonian designer who became famous in the early 90-ies as a shoe- and fashion designer. In 2009 he founded his own studio Borealis, turning to product design and architecture. The comb bookshelf is a flat-pack product. The set consists of 15 film-coated birch plywood shelves and 6 metal rings to hold the corners together, two dowels and two hooks to fix the shelf to the wall. With the directions provided with the product, it is very easy to put together and even without the directions it is logical, as it is like a puzzle. We have managed to put it together in just a few minutes. The set actually comes with 6 metal rings to hold the corners together, but we have chosen not to use the rings and just tie them together with a very strong white string a few times. Using the rings would certainly ensure more stability, but as we don't intend to put much weight on it we chose to try it without the rings. The comb bookshelf is available in 4 different sizes and three different colours. Originally we were just looking for a special way to present some of the little things we have, as we wanted them to stand out, without just using a traditional shelf. Soon we found the comb bookshelf and from the first time we saw it we absolutely loved it, and once it was placed on our wall it has exceeded all expectations, which is why we have chosen it to be our product of the month January 2016. Something we think is great about the shelf is the option to not fill all the triangles without it looking empty or only half finished, that way it never looks overloaded and every object can come into its own much more. The shelf bulges from the wall like a sector of a sphere, creating a geometric effect and making it a beautiful eye-catcher. The shelf is from very high quality byrch wood and when you stand close to the shelf there is a soft scent of wood, which we find very pleasant. 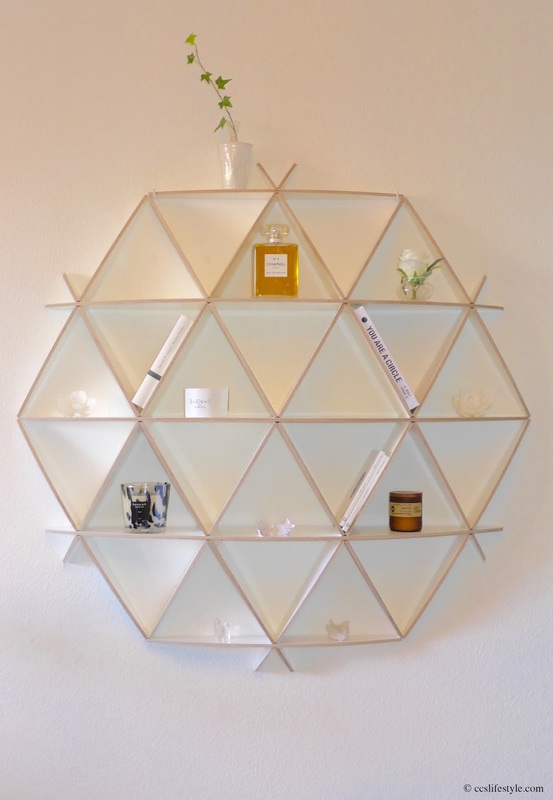 We think the comb shelf has a very unique and design which reminds us a bit of the flower of life. It allows you to present books, candles, perfumes, plants or decorations etc. on a wall without making the wall look overloaded. book: You are a circle by G. Wolf "Prof. G"